A short documentary about Mom, Alzheimer's, and loss. The Mill Valley Film Festival declined i live In Life. They “appreciated the opportunity to see the film but regret that we were unable to find a place for it in this year’s program.” As much as I try to remind myself that I’d be lucky if I have to submit to only fifty festivals for even one acceptance, I can’t help feeling some disappointment. Oh well. Onwards! Now, for the good news: i live In Life played last Saturday at the Katra Film Series Special Edition. One of a slate of a seven short films, it was voted best film of the evening! That was really nice. This means the film will be included in the Annual Katra grand finale and compete for real prizes! I owe a huge debt of gratitude to my many friends and supporters who came to the show. You know who you are! THANK YOU! I don’t know when the finale will be, but if you’re in the NYC area, do consider coming. Your votes could make all the difference! The film will play as part of the Katra Film Series’ Special Edition on Saturday Aug. 24. If you’re in the NYC, please come check it out! There will be drinks specials, Q&A, free food (hopefully), and a complementary after-party. The audience votes on the best film of the evening, so I could really use your support! (Why would you vote for any other film? ;-), and the winner gets to compete in the annual grand finale! Hi Ho, Hi Ho, Alons nous a travailler! From France comes an interesting study linking retirement age and Alzheimer’s risk. Results from INSERM were presented at Alzheimer’s Association’s 2013 International Conference in Boston. They found that delaying retirement by a year reduced the risk of dementia by 3.2%, and the effect is cumulative: the overall risk reduction was 14%. That’s a pretty significant impact! Back in 2008, I was lucky to be present when the late Dr. C. Everett Koop gave an interview for the film I was editing at the time: New York Street Games. He was about 92 at the time, but still sharp as a tack. Off camera, he discussed the secret to his longevity: work. All his friends who had retired, he said, were dead. He made a point to keep on working. Clearly, he was on to something! Now, my Mom’s Alzheimer’s came on strong 3 years ago, when she was about 84. She was still publishing papers into her late 70’s. I am certain that her diligence helped delay onset of symptoms. In hindsight, I can see lots of early signs that I hoped – wishfully – were just signs of ordinary aging. It’s also likely that the progress of my Mom’s disease is an example of the benefit of ‘cognitive reserve‘: the idea that factors such as a life of challenging mental work, speaking several languages, having a wide circle of friends, an active social life, and intellectually challenging hobbies can offset the symptoms of Alzheimer’s, even when the physical damage to the brain is present. In other words, people with deep cognitive reserve can have the disease without the symptoms. This suggests that we can significantly reduce our future health-care cost burdens by providing people with enough education that they’re at least bilingual, and that they can pursue careers as knowledge workers instead of WalMart greeters and McD’s burger flippers. Doing so would very likely have tremendous knock-on benefits such as increased innovation, job creation, more highly skilled workforce, etc. So here’s my plea to all the ‘fiscal conservatives’ in Washington: save money by investing wisely! Education before weapons, please! I knew this day was coming. 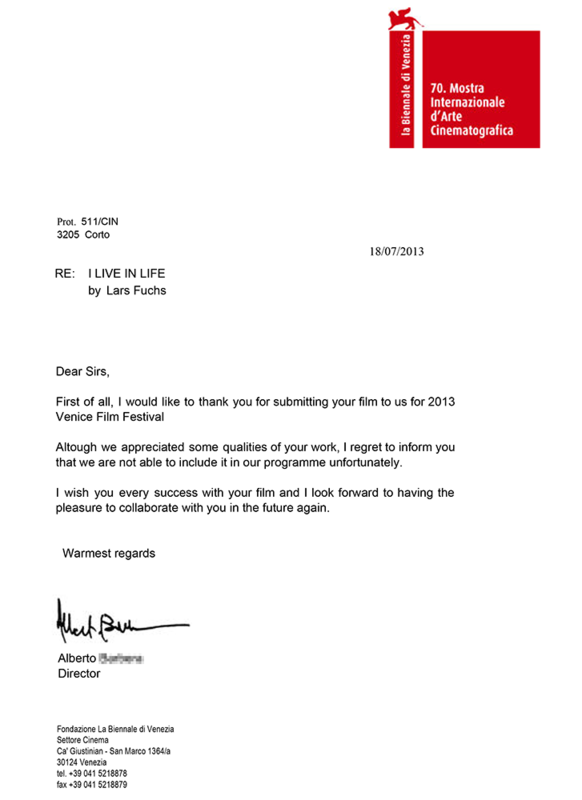 I’ve gotten my first reply from a film festival, in this case the Venice Bienale. Did I get in? No. I received instead a very courteous ‘ding‘. I feel a bit like I’m back in high school waiting for college acceptance letters. Here’s the nice letter, which they sent as a PDF so I can print it out and mount it in a nice decorative frame. Not. I’m sure this is but the first of many, so it’s just as well I make a start of getting used to it. In the name of… progress? Even before I read it, I immediately thought of my mother. She was well aware of the antipathy towards using animals for research, and it really got her dander up. Her work, of course, depended on animals. For much of her career, she used rabbits, but in the later years she did much work with cows. Now, I ought to come clean right off the bat and say that I agree with Prof. Fisher and my Mom. For one thing, I owe my life to a group of rabbits I will never know. My Mom discovered not only the link between oxytocin and the onset of labor, but also the fact that alcohol inhibits the release of oxytocin and thereby can inhibit premature labor. When I was nearly born over two months prematurely, Mom administered herself a dose of ethanol (in the form of whiskey), based on the results she found in her rabbits. And so instead of being severely premature – a very high-risk situation with a poor prognosis in 1963 – I was born healthily to term 8 or 9 weeks later in 1964. I am an animal lover, and there are moments when it can be difficult to accept that Mom performed research on animals. I know that she was contemptuous of objections to the use of animals in scientific research. She was acutely aware of the difference between peer-reviewed scientific research, for which she felt the use of animals was self-evidently necessary, and product and cosmetic testing. I don’t think Mom ever opposed ending product testing on animals. As a scientist she knew it was unnecessary. Her big blindness, I think, was that she could not see that the most of the rest of the world couldn’t make that distinction. Now, of course, animals are absolutely essential to Alzheimer’s research. If we’re ever going to figure out how this dread disease works and how to fight it, it will be because a lot of rats and mice will have given their lives to the cause. I don’t say that to be glib or facetious. We owe a debt to these animals and to honor that debt we must hold our scientists to high ethical standards in the use of animals in research. It sounds like Prof. Fisher, herself studying Alzheimer’s using mice, is doing all the right things. Her editorial omits mention of product testing, which I think is a serious omission. The world needs to understand that testing mascara and shampoo is not the same thing as looking for a cure for Alzheimer’s.
! A report of exciting research into treatment of memory loss, dementia, and surprisingly, addiction. Studies show profound epigenetic effects on the formation and recovery of long-term memories. Memory associations play a big role in addiction, so there’s a connection. I find epigenetics really fascinating, not least for the meta-lesson it teaches us about scientific understanding. For a long time, all genetic expression was thought to be evolutionary – your genes behaved in ways determined by thousands of millennia of evolutionary pressure. But epigenetics show us that the present environment can affect gene expression radically. The lesson to learn here: we should never think we know, but always assume that though we might be less wrong than before, we’re still basically always wrong. The following is a list published by The Alzheimer’s Foundation, as reported by PBS.org. Everyone should read this – print it out, even, and refer to it a couple of times a year. 1. “Old age” is not an excuse. While some memory loss, cognitive decline and behavioral changes are normal as we age, Alzheimer’s disease is not a normal part of aging. Advanced age is the greatest known risk factor, however, with incidence of the disease doubling every five years after age 65. Also, while Alzheimer’s disease typically strikes people 65 and older, a rarer form of the disease, known as young-onset or early-onset Alzheimer’s disease, presents in people as young as in their 30s and 40s. All of us from time to time forget someone’s name or what we ate for breakfast. But consistent forgetting raises a red flag. It’s easy for anyone to forget to pay a bill once. There is a problem if the same statement gets paid five times or if months go by without paying bills. 3. Symptoms can mimic other conditions. Identifying the disease or problem that is causing memory loss helps with next steps. Some memory problems can be readily treated, such as those caused by vitamin deficiencies, depression or thyroid conditions. Other memory problems might result from causes that are not currently reversible, such as Alzheimer’s disease. With Alzheimer’s disease, symptoms gradually increase and become more persistent. 4. Not every case is the same. There are general warning signs of Alzheimer’s disease, but not everyone exhibits the same ones or at the same time in the progression of the illness. In addition, some individuals with the disease manage to cover up symptoms: for example, they might hide behind jokes or disinterest. 5. Alzheimer’s impacts day-to-day living. Alzheimer’s disease is not only about memory problems; it also affects a person’s ability to function day-to-day. It can cause difficulty performing familiar, pre-programmed tasks like dressing or bathing; misplacing items more frequently; becoming lost while walking or driving; and loss of interest in important responsibilities, such as paying bills. The concern is not so much if someone forgets where the car keys are, but if the person does not know what the keys are used for. For pre-retirees, symptoms of Alzheimer’s disease often first become noticeable in the work environment. A supervisor, for example, might note that the person is unable to concentrate, can no longer multi-task or is performing at a lower level than in the past. 6. Alzheimer’s disease has cognitive symptoms. 7. Alzheimer’s disease has behavioral symptoms. Behavioral symptoms are often what trigger family caregivers to more seriously weigh additional help, such as a home health aide or long-term care placement. The results of a Harris Interactive survey prepared for the Alzheimer’s Foundation of America found that about half of family caregivers surveyed said they would consider long-term care if aggression became too difficult to handle, the person self-harms or they fear injury or harm to themselves or other family members. 8. Check out warning signs. According to a study of participants who obtained free, confidential memory screenings during the Alzheimer’s Foundation of America’s National Memory Screening Day in 2010, 74 percent were worried about their memory, but 83 percent of them had not discussed concerns with their health care provider. Why not? Forty-six percent said that they did not think that their memory issues were severe enough, and 20 percent said that their health care provider had never asked them about their memory. Start with your primary care physician. Depending on findings, the physician may recommend follow-up with a specialist. If you’re a Medicare beneficiary, it’s important to know that “detection of cognitive impairment” is a feature of the new Medicare annual wellness exam. 9. Diagnosis is 90 percent accurate. Although Alzheimer’s disease can only be confirmed by an autopsy, clinicians can now diagnose Alzheimer’s disease with up to 90 percent accuracy. Diagnosing “probable” Alzheimer’s disease involves taking a complete medical history and conducting lab tests, a physical exam, neuro-psychological tests that gauge memory, attention, language skills and problem-solving abilities, and brain scans. 10. Don’t just take the diagnosis and run. What other tests should I take? Should I see a neurologist, geriatrician or other specialist? What are all the available treatments, and their effectiveness in terms of helping to slow progression of symptoms? Do the medications come in different forms (liquid, capsule, patch)? Are there clinical drug trials that would be appropriate for me? Besides medication, are there behavioral interventions and lifestyle changes, such as diet, exercise and mental activities, that might help? This process involves — and helps — both the person with Alzheimer’s disease and family members. Someone who obtains a diagnosis earlier in the disease process when cognitive skills are more intact can make legal decisions and express wishes for end-of-life care, relieving family members of that decision-making. Support services can help lessen the emotional, practical and even financial toll of the disease; research studies show that caregivers who receive counseling and support services can help delay placing their loved ones in nursing homes. An Icelandic company, Mentis Cura, claims 85% accuracy for their newly-developed non-invasive test for Alzheimer’s Disease, a biomarker they’ve called Sigla. This is really interesting news. First, because proper treatment begins with proper diagnosis, something that has heretofore been very difficult for Alzheimer’s. But it’s also interesting because of the underlying technology – it’s all old-hat! They’ve come up with an ingenious method that combines EEG, a tried-and-true technology that’s been around for years (first human EEG was measured in 1924! ), with the computing power of modern ‘Big Data’ techniques. The system is able to distinguish between depression and dementia, and even between Alzheimer’s, Mild Cognitive Impairment, and Lewy Body Disorders. My only concern is the fact that they use a proprietary database. I certainly understand why – it’s the only way the can make money from it – but I wonder how they accumulated the dataset. Did they use publicly available or government-funded sources? If so, is it fair to commercialize them? More importantly, if it’s proprietary, how can it’s effectiveness be verified? The flipside of course is that it will not be that hard for others to develop their own database. Developing a non-infringing algorithm may prove tougher, but perhaps not impossible. I submitted the film to CPH:DOX today. I’m crossing my fingers that I do well in my home country! Luckily I was allowed to submit as a Dane, saving me the €10 entry fee. First freebie! Woot! Submitted to the True/False festival today, bringing the total up to 4. Venice Bienale and CPH:DOX next!